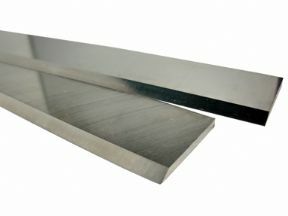 1 pair of T1 18% HSS Planer Blades to suit most standard types of planers from four sided moulders to surface thicknesser machines. Produced in matched pairs, each set will be supplied HAND FINISHED to ensure a perfectly sharp, edge, free of nicks and burrs. Most other standard lengths of HSS planer blades can be found within Knife-Point website and we also supply full bar lengths at 1060 mm long for the user to cut to his specific requirements.